Hello, everyone! Welcome to International Sewing Month 2016! 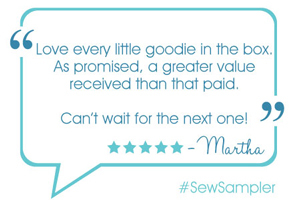 We're very excited about Sewing Month, as you can imagine! We love this little business Kimberly started 13 years ago, and thank you for being a part of our Fat Quarter Shop community! FUN, INSPIRATION & FAB GIVEAWAYS! We'll be posting weekly here on the Jolly Jabber blog, and will be offering at least FIVE different giveaways during the month. Better yet? We'll have multiple winners for each giveaway. Woo hoo! In addition we'll be sharing some of our latest AND some of our greatest. Prizes and inspiration will abound! We'll also be offering an exclusive, FREE pattern at the end of the month, so stay tuned for more Sewing Month fun! Let's start this celebration off with a bang! 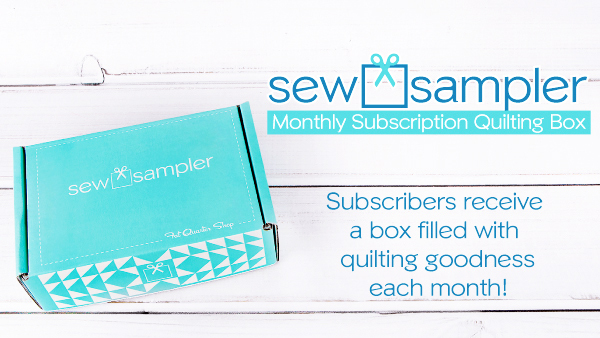 THREE lucky people will win one of our September Sew Sampler Monthly Subscription Boxes, which will be shipping out on September 20th. The boxes retail for $24.95 per month (+ shipping and handling), but the product value is always much greater. 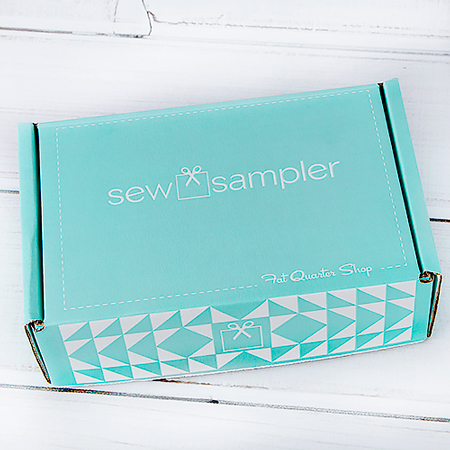 If you're not familiar with Sew Sampler, you should be! Our happy customers rave about it each month, and we love bringing joy and great products to our customers. Leave a comment on this post sharing your favorite type of quilt block or quilt. For example log cabin, simple squares, equilateral triangles, tumbler, etc. Giveaway ends on Sunday, September 4, 2016 at 11:59 p.m. The winners will be chosen at random and will be notified by email. The winners will be announced in an update to this post. Good luck, everyone! Congratulations to our three winners: Mara, Carol C. and Veronica! They've been contacted by email regarding their prizes. 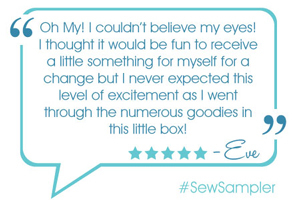 We thank you for your entries, everyone, and look forward to treating you to more surprises and giveaways during Sewing Month! Happy Sewing Month from Kimberly & Kevin Jolly, and everyone at Fat Quarter Shop!